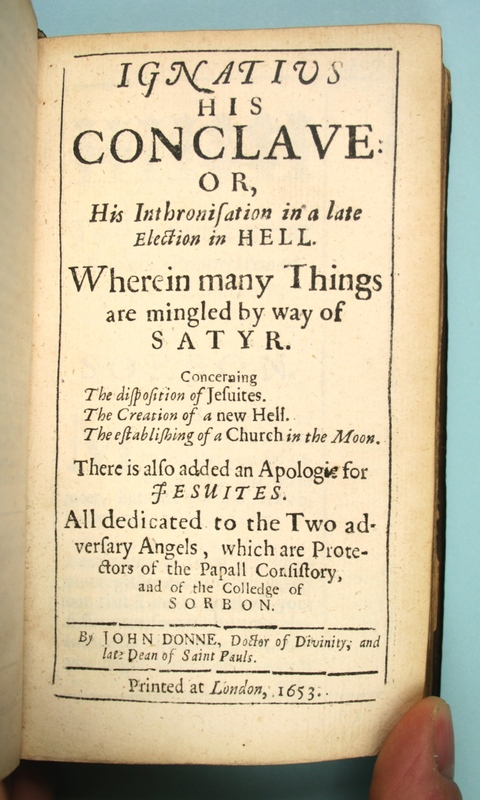 Essayes in divinity; by the late Dr Donne, Dean of St Paul’s. Being several disquisitions, interwoven with meditations and prayers: before he entred into holy orders. Now made publick by his son J.D. Dr of the civil law. THIRD EDITION, FIRST ISSUE, and FIRST EDITION, respectively. Bound in contemporary calf, covers ruled in blind with blind-tooled fleuron cornerpieces, early paper label on spine, plain endpapers, red-sprinkled edges; extremities rubbed, spine with some minor repair but unusually well-preserved.The front hinge is tender. The topmost cord is snapped but it is still pretty sound. “Ignatius his Conclave. Or, his Inthronisation in a late election in Hell” has a separate title page dated 1653; signatures and pagination are continuous. The last two leaves of Ignatius his conclave are blank. 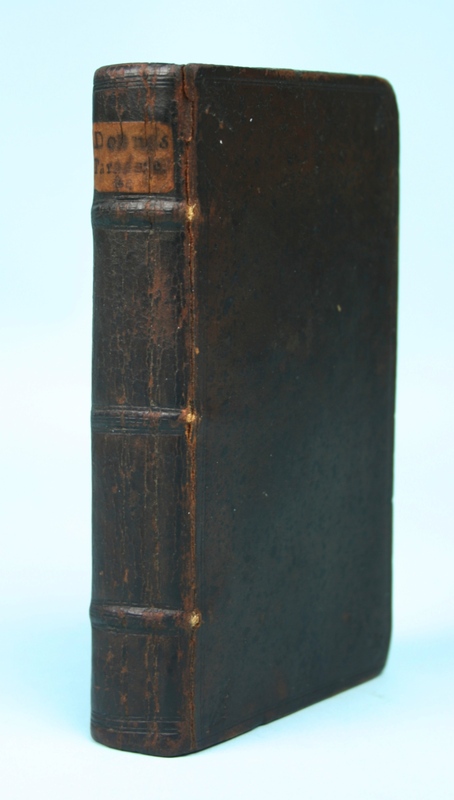 “Essayes in divinity” has separate title page, with the imprint “printed by T.M. for Richard Marriot, … 1651”, its own pagination, and register. “When the younger Donne decided to make Juvenilia more respectable by adding the Essayes in Divinity he felt he must try to suppress his dedication to Sir Henry Vane the younger with confusing results. … It seems probably that the address to Vane, republican and regicide, came to be regarded as impolitic when he was dedicating the composite volume to Francis Lord Newport, a consistent royalist” (Keynes, p. 126). The present volume retains the dedication to Newport, but the one to Vane (A2–6) is cancelled, as usual. Donne’s ‘Ignatius his Conclave’, a damning, satirical exposé of the Jesuits and the order’s founder, Ignatius of Loyola, appeared one year after his ‘Pseudo-Martyr’, a work of deadly seriousness in which Donne argued that English recusants, rather than risking martyrdom in refusing the oath of allegiance, risked suicide instead. “Pseudo-Martyr” was a work of serious controversial literature; “Ignatius”, while still revealing its author’s erudition, is rich in comedic –if biting- episodes. The six contestants are, in order of appearance, Copernicus, Paracelsus, Machiavelli, Columbus, Pietro Aretino, and Filippo Neri. Copernicus makes his case first, explaining that his heliocentric theory (which “lowers” the Sun and “raises” the Earth) has had the effect of raising poor Lucifer from the lowest position in the heavens to the highest. Lucifer, in a quandary, calls upon Ignatius for his opinion. Ignatius (who by that time had learned a great deal about astronomy from the Jesuit scientists who showed up almost daily in Hell) and, while admitting that Copernicus’ theory is correct, tells Lucifer that Clavius, the great Jesuit astronomer who staunchly denied heliocentrism in defense of the incorrect doctrine of geocentrism, deserves a spot before Copernicus. In this edition, Donne’s son added an additional paradox (XII. below), seven additional problems (XI – XVII below), two “Characters”: “The Character of a Scot at First Sight” and “The True Character of a Dunce”. To these were appended an “Essay of Valour” and Maine’s translation of some of Donne’s Latin epigrams. The twelve “Paradoxes” are as follows: I. A Defence of Womens Inconstancy. II. That Women Ought to Paint. III. That by Discord things increase. IV. That Good is More Common Than Evill. V. That all things kill themselves. VI. That it is possible to find some vertue in some Women. VII. That Old men are more fantastike than Young. VIII. That Nature is our worst guide. IX. That only Cowards dare dye. X. That a Wise man is known by much laughing. XI. That the gifts of the Body are better than those of the Minde. XII. That Virginity is a vertue. These are followed by seventeen “Problemes”: I. Why have Bastards best Fortunes? II. Why Puritans make long Sermons? III. Why did the Divell reserve Iesuites till the latter Dayes? IV. Why is there more Variety of Greene, than of any other Colour? V. Why do Young Lay-men so much study Divinity? VI. Why hath the Common Opinion afforded Women Soules? VII. Why are the Fairest falsest? VIII. Why Venus Starre only doth cast a shadow? IX. Why is Venus Starre Multinominous, called both Hesperus and Vesper? X. Why are new officers least oppressing? XI. Why doth the Pox undermine affect so much to undermine the Nose? XII. Why die none for love now? XIII. Why do women delight much in Feathers? XIV. Why doth not Gold soyle the fingers? XV. Why do Greate men of all dependants, choose to preserve their little Pimps? XVI. Why are courtiers sooner Atheists than men of other conditions? XVII. Why are statesmen most incredulous?